This can fix your capitalisation and ensure your bullets are punctuation correctly. Any incorrect words are underlined as you go. How can I check my Spelling ? 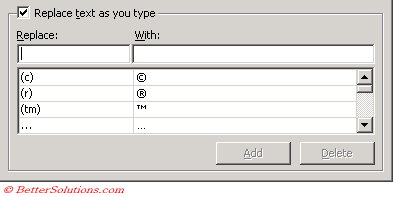 There are several ways to display Spelling dialog box but the easiest way is to use the command on the Standard toolbar. Spelling - This can be found on the Standard toolbar. Alternatively you can select (Tools > Spelling) or use the shortcut key (F7). The Spelling dialog box will display any unknown words and suggests replacements. It allows you to choose which elements to check so you do not waste time checking words that are actually correct. Excel can check the spelling of text on the current worksheet, in a range of cells or an individual cell as well as just a selection of text. Only the spelling on the active worksheet will be checked. If you want to check the spelling in the whole workbook you must select all the worksheets first. Although using the spell checker is not a substitute for careful proof reading it can catch obvious errors that may be overlooked. It is also always worth checking your spelling at the end when you have finished your presentation. If any spelling mistakes are found that particular slide is activated and the word is highlighted and the dialog box suggests some corrections. PowerPoint always checks your spelling in the entire presentation and always starts from the first slide, assuming a selection has not been made. slide titles, body text, notes, text objects added to slides, tables ??? Any embedded objects are not checked (e.g. Charts). Using AutoCorrect and be able to check your spelling are two features that help make entering and editing text a lot easier. The spell checking will start from the active cell to the end of the worksheet. Always start spell checking from the top of your worksheet. Press (Ctrl + Home) before selecting (Tools > Spelling). When you check the spelling in a presentation PowerPoint will alert you if it finds any words that it does not recognise. Alternative words will also be suggested. Ignoring words that are in uppercase is an easy way to exclude acronyms and abbreviations. AutoCorrect can be used to create your own typing shorthand. To quickly check the spelling of a word highlight the word and press F7.